Mahadeo temple at Bhojpur near Bhopal. bl.uk > Online Gallery Home	> Online exhibitions	> Asia, Pacific and Africa Collections	> Mahadeo temple at Bhojpur near Bhopal. 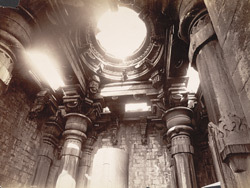 Photograph with a view looking up towards an incomplete dome inside the Mahadeo temple at Bhojpur near Bhopal in Madhya Pradesh, taken by Deen Dayal in the 1880s, part of the Bellew Collection of Architectural Views. Bhojpur was founded by King Bhoja (ruled 1000-55), who dammed the river Betwa here and created a reservoir. Only traces of the three huge dams remain, the reservoir was destroyed by Sultan Hoshang Shah in the 15th century. Bhoja had also begun constructing a Shiva temple which was left unfinished. It enshrines an immense linga (phallic form of Shiva) which is about 8 ms high.